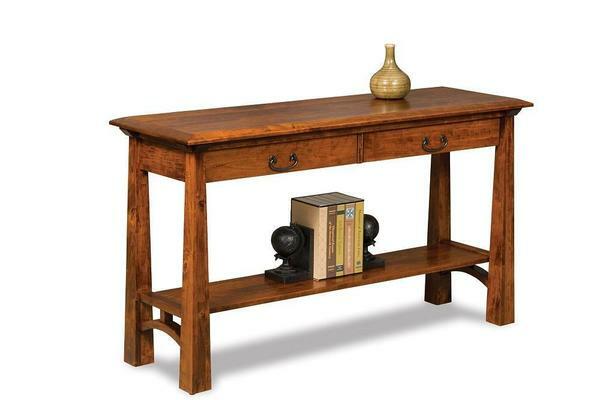 Gentle arches and bold tapered legs call attention to our Amish Artesa Open Sofa Table with Drawer and Shelf. A lovely addition behind a sofa or against a wall in a living room, entryway, hallway, or office, two drawers and an open shelf offer space for storage. This piece features a 1-inch-thick top, four solid Shaker-style legs, full extending drawers, and the hardware shown (P-2 wrought iron pull). Custom options include Blum soft-close undermounts for the drawers and your choice of wood type, finish, and hardware.